Have Low Base Rates Permanently Changed Financial Services? Persistent low base rates have caused a sustained period of depressed financial returns, resulting in long-term changes to the way financial services products are funded. Falling returns in many traditional investment areas have forced both shorter-term and longer-term investors to engage more extensively in higher-risk areas. In this search for yield, new sources of funding have entered sectors previously seen as too niche and complex, further pressuring the returns available to traditional funders. The participation of new funding sources has had far-reaching effects in some sectors, including speciality (re)insurance, MGA models in insurance, equity release and second charge lending. For well-funded and well-prepared industry participants, there is an opportunity to expand into new customer segments and address new needs. The sustained period of depressed financial returns because of persistent low base rates has resulted in long-term, if not permanent, changes to the way some financial services products are funded. In the search for yield, new sources of funding have entered sectors previously seen as too niche and complex, finding ways to address them which won’t easily be unlearned. Base rates have been so low for so long that old-school assumptions that the investment cycle will inevitably turn (with a flight from these newly capital-rich areas, for instance) are no longer obviously true, at least in the short term. Investors and funders need to recognise this, and industry participants awaiting the “inevitable” retrenchment of competition as rates eventually rise may need to think again and consider what may be a new paradigm. For those players that undertake in-depth market analysis to inform their strategic direction, there are significant opportunities in these once-unloved niches. 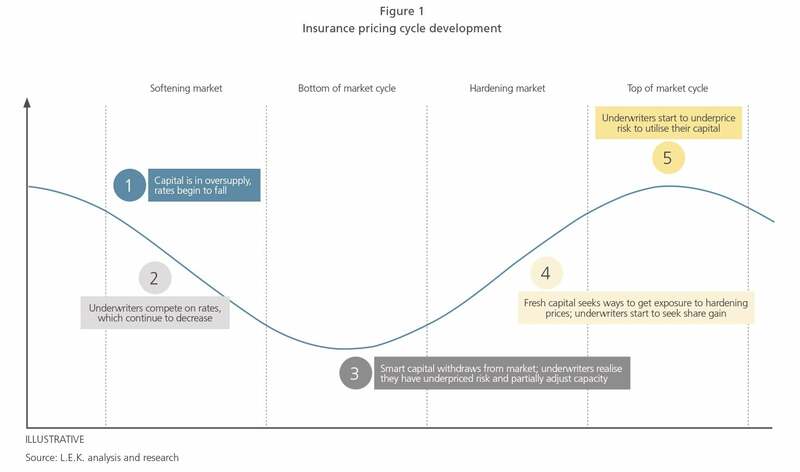 Historically, in many investment areas capital flow has been driven by a repeating cycle, with the insurance industry being the classic example. Premiums rise after significant losses, leading to increasing profits and greater funding, which in turn pushes prices down until the cycle starts again (see Figure 1). Yet this traditional model appears to be broken or severely strained. Sustained low base rates have transformed the absolute and relative attractiveness of many areas of investment, affecting both the amount and destination of investors’ capital. The new normal is for capital holders to seek more risk, rather than less, in order to achieve their target levels of return. Returns in many traditional areas of investment have dropped to the extent that capital holders have “shopped around” far more than before, including outside their normal focus zones. In bonds and other categories, returns have fallen below threshold levels for many investors, giving them little option but to move their funds. The longevity of this effect has meant that investors have had to review their strategic options and take action because, given their investment horizons and the need to deploy capital, they can no longer afford to “wait it out”. The situation is urgent for shorter-term investors, but even longer-term investors, such as pension funds and family offices, which can usually ignore the short part of the yield curve, have been affected and have been forced to invest more extensively in higher-risk areas. There have been far-reaching effects in some subsectors of financial services. This has led to a significant change in the volume of capital invested by those with relevant expertise and underwriting experience. It has also led to the entry of new funder types that were traditionally thought (including by themselves) to be unqualified to participate, but that are attracted by the returns. This drive by new funders to participate in niche sectors has resulted in changes to distribution and underwriting models, with underwriting, origination and product design separated from capital provision much more rapidly and to a greater degree than ever before, as the examples below demonstrate. The resulting waves of new money have added further pressure to the returns available to previous “traditional” funders. Speciality (re)insurance has seen a recent flood of non-specialist capital providers (i.e. those with no underwriting expertise or interest in acquiring it) in search of better returns, in particular in insurance-linked securities (ILS) like catastrophe bonds, new collateralised vehicles and post-event funds, as well as other investable financial instruments (see Figure 2). In 2017, pension funds invested nearly $90 billion in ILS, over 3.5 times the amount invested in 2011, according to Wills Towers Watson Securities data1. This was in spite of the sector’s $136 billion of losses that followed the three U.S. hurricanes and California wildfires in 2017 — catastrophes that cost, for example, Berkshire Hathaway insurance underwriting losses of $3 billion after 14 consecutive years of profits2. In terms of new business model development, the past few years have seen the rise of outsourced managing general agents (MGAs) to increase insurers’ underwriting capacity. For example, members of the U.K.’s MGA Association now write gross written premiums of over £5 billion, up from £2.5 billion in 20133. The strong growth of the MGA model has allowed the greater separation of underwriting expertise from capital provision. Crucially, the underlying capacity provision to MGAs now much more frequently includes non-specialist capital providers who, in their search for yield, are prepared to invest in this category due to a dearth of other opportunities. Now that this route to market has been established, it will not go away: non-expert capital is available to participate whenever returns indicate that it is favourable to do so. As a result, a substantial amount of new capital has arrived in equity release, helping fuel a 25% annual growth rate in the value of the sector since 2012 to reach over £3 billion and over 37,000 new customers in 2017, and £3.6 billion in 2018, a further growth of 19% from an already substantial base4. Similar to specialist (re)insurance, now that this route to market has been established, it will not go away in the future, with non-expert capital available to participate whenever returns indicate that it is favourable to do so. Second charge mortgage lending is another formerly niche market that is becoming increasingly mainstream in the U.K. It has witnessed substantial growth in the past few years, with the Finance and Leasing Association stating that the market’s total value grew to over £1 billion for the 12 months to December 20185. Lower base rates have resulted in transformational changes to the addressable market. Typical prime rates were in mid-to-high single digits around the time of the financial crisis, meaning that prime customers, having other lower rate options such as unsecured loans, would reject these products out of hand. However, rates available through prime lenders are now often in the range of 3-4% — comparable to prime mortgages — which radically increases the range of potential customers. Now that these customers are, for the first time, aware of second charge as a viable alternative financing option, it is likely that this product has permanently entered the mainstream. Simultaneously, second charge has also seen an increase in funding through securitisation. For example, Optimum Credit completed a public securitisation of second charge mortgages in July 2017, the sector’s first since the credit crisis. Its triple A notes were more than two times oversubscribed. Two months later, lender Together was similarly oversubscribed when it completed its £275 million securitisation. “Standard” funding has thus re-entered this market, again through a new route that is unlikely to be forgotten. The “lower for longer” dynamic has, at least temporarily, both grown the size of the addressable market for a number of previously niche markets and opened up participation opportunities to new sources of capital. These are facts which industry participants, funders and investors alike need to be aware of as they look to address the available commercial opportunities. New funding has also had the secondary impact of making it easier to scale previously balance sheet-heavy businesses originating financial services products, most notably in insurance and lending. Rather than self-funding, businesses in these areas can now, if they want to, focus on their underwriting and origination skills. In addition, when their capital providers are at the limits of their investment appetite or capacity, rather than selling out before they realise the fruit of their operational labours, they may continue with external capital from non-expert or securitisation sources. This will allow them to hold on until fuller operational maturity and thus an increased valuation at sale. For early stage or otherwise capital-constrained investors in these categories, there are opportunities to hold on to their assets for longer and reap more of the rewards of developing mature businesses. By sourcing alternative external funding, they can bridge the gap between implementing actions with medium-term impact and achieving the “runs on the board”, which lead to full valuations. LDF, an SME lending platform developed by Cabot Square Capital, is an archetypal example of this approach. Furthermore, there are fresh opportunities to act as market intermediaries, through underwriting and product structuring, without the need to self-finance the balance sheet: a new class of investible business is emerging. Persistent low base rates have resulted in a sustained period of depressed financial returns. However, as a result, a wide range of new investment opportunities has arisen for funders and investors. Those that take a robust approach to market scoping, scenario planning and business case development may capitalise on these complex and rapidly evolving environments. For well-funded and well-prepared industry participants, the opportunity to expand to new customer segments, address new needs and grow the size of the pie has never been better. 4U.K. Equity Release: Cyclical Boom or New Paradigm?